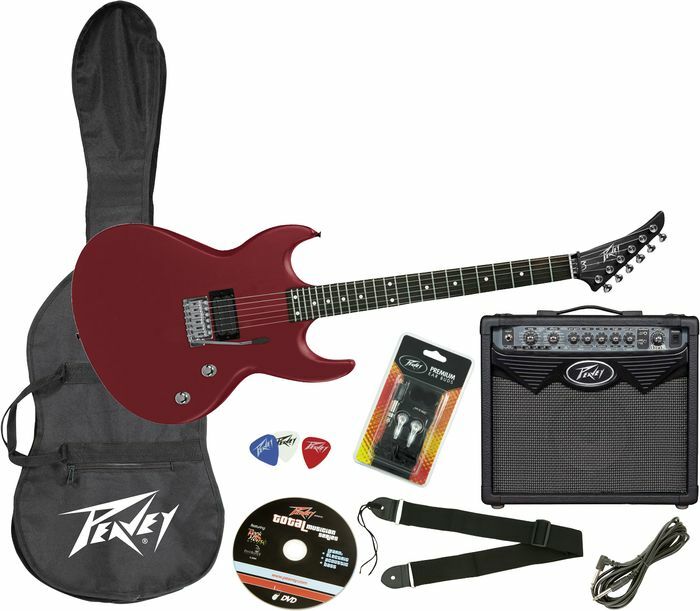 Vypyr Stage Pack X contains the VYPYR 15 amplifier, Peavey PXD 23 Guitar In Black or Blood Red, Earbuds, 3 Picks, Cable, Strap, Gig Bag, and Instructional DVD. The SC-2 features humbucking pickups, alnico loaded for warmth, punch and presence, harmonically positioned and frequency calibrated. The SC-2 is an elegant two-pickup guitar. All Single Cut guitars feature treble-compensated volume controls that enhance pickup clarity at low volume levels. The SC-2 is crafted from basswood with an integral center body section, carved top and a deep lower cutaway with scoop for extended access to the upper register. The SC-2 features an 'Extended Tail Section' meaning that the neck pocket is extended all the way to the pickup cavity, vastly increasing the amount of contact area of the neck to the integral center body section of the body. This has the effect of increasing the sustain of the guitar and is a feature not seen on guitars costing many times as much as the SC-2. The SC-2 features a hard rock maple neck with rosewood fingerboard. The SC-2 boasts gloss black, cherry burst and vintage tobacco burst finishes, with chrome hardware and standard dot inlays. Peavey Predators are excellent guitars. The upper cutaway is slightly longer than most guitars giving the Predator a clean swept-back design that looks and feels fantastic. The Predator includes a licensed Floyd Rose(r) locking tremolo and chrome sealed machine tuners that fit snug. Both pickups are humbucking and can be individually switched or blended to accommodate any style of music or playing you desire.